The seven-day Libya Desert Challenge, a car rally mainly for 4X4s across the southwest of the country, finished yesterday. 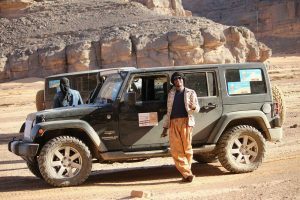 In total, there were 32 SUVs and 77 drivers taking part in the event which started on the Algerian border near Ghat and took in the Acacus Mountains. Rather than being a race, it was a challenge against the elements and for fun, driven in desert buggies, jeeps and other 4x4s. It comes only a month after the Waddan “TeTe” Desert Rally, a race that started from Waddan and then ended about 25 kilometres south of the desert oasis town.